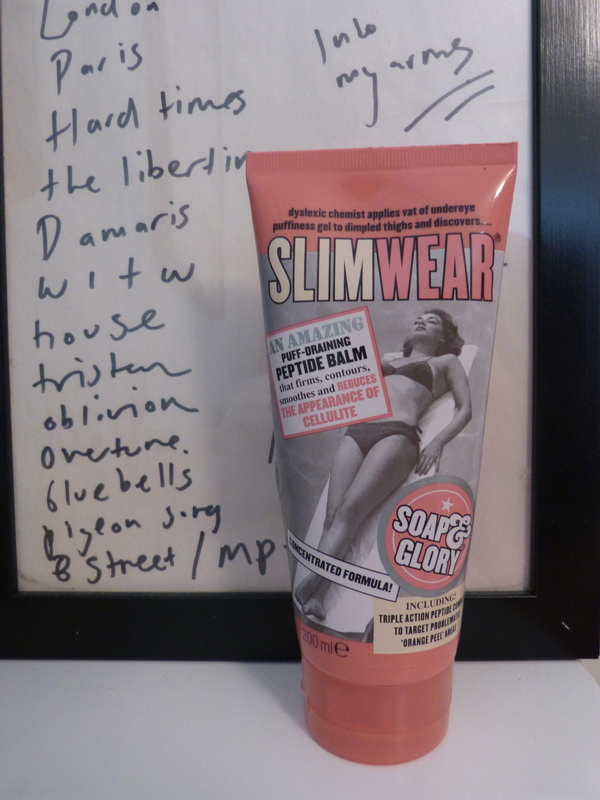 I first picked up Soap and Glory’s Slimwear about six years ago, when I was first attempting to lose weight, but lost interest in both the weight-loss and this supposedly cellulite-busting cream quite quickly. Having been shut at the back of a drawer for a while, I’m aware that this cream might not be at its best, but since I’ve been trying to use it up, I thought I’d give you a little peek at how I’m finding it a second time round. Slimwear is a bright minty green cream-gel formula with a toothpaste smell to match. This is strongly, very strongly, mint-scented, and also has that cooling/tingling effect you find with a lot of mint products. The cream itself is quite lightweight, not sticky, and absorbs reasonably quickly, but I find the scent lingers for far longer than I’d like – I don’t want to smell like a candy cane! In terms of its cellulite-tackling powers, I have to say that Slimwear falls rather short. I don’t have a particular problem with cellulite, but I can’t see a blind bit of difference even after using this for three weeks! It made me smile that there’s a little note on the back of the bottle which essentially says ‘this won’t make a difference unless you eat well and exercise’, but actually, it’s not even been proven that cellulite is anything to do with your body weight. So really, although marketed as a wonder cream, even Soap and Glory are aware that it’s more of a glorified moisturiser. As a moisturiser, it’s lovely, especially on summer days when the cooling effect really comes into its own. However, I can’t say I’d choose it over any other kind of moisturiser – I like something thicker and less expensive! What do you think? Is there any truth in cellulite-busting creams? This entry was posted in Beauty and tagged beauty, beauty products, beauty review, cellulite, moisturiser, slimwear, soap and glory, toiletries. Bookmark the permalink. Is that a Patrick Wolf set list?! It sounds nice enough, but I feel like most cellulite creams etc are a scam :(. Yeah, it’s a total scam, but one that teenage me was taken in by! I’m not even sure if they sell this anymore (although they have others that claim the same things) so maybe they realised that people knew it was useless! All those anti-cellulite creams are a big sham 😉 It only really works on psychological level. If someone’s bothered with cellulite, using a cream makes the person feel better by providing an action to take. Doesn’t make a flipping difference to fat (just how penetrating do they think cream is??). I do like the idea of mint tingly cream for summer though! They should just market it as that – refreshing summer moisturizer.